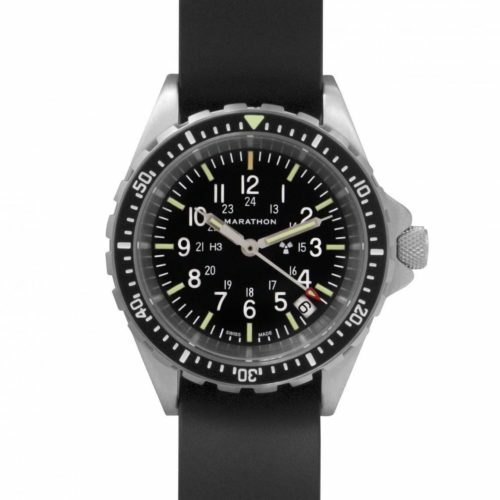 The Marathon Search & Rescue Diver’s Quartz Medium is perfect for someone who wants a tough, reliable, military issue dive watch, yet prefers a reduced size. 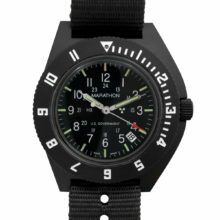 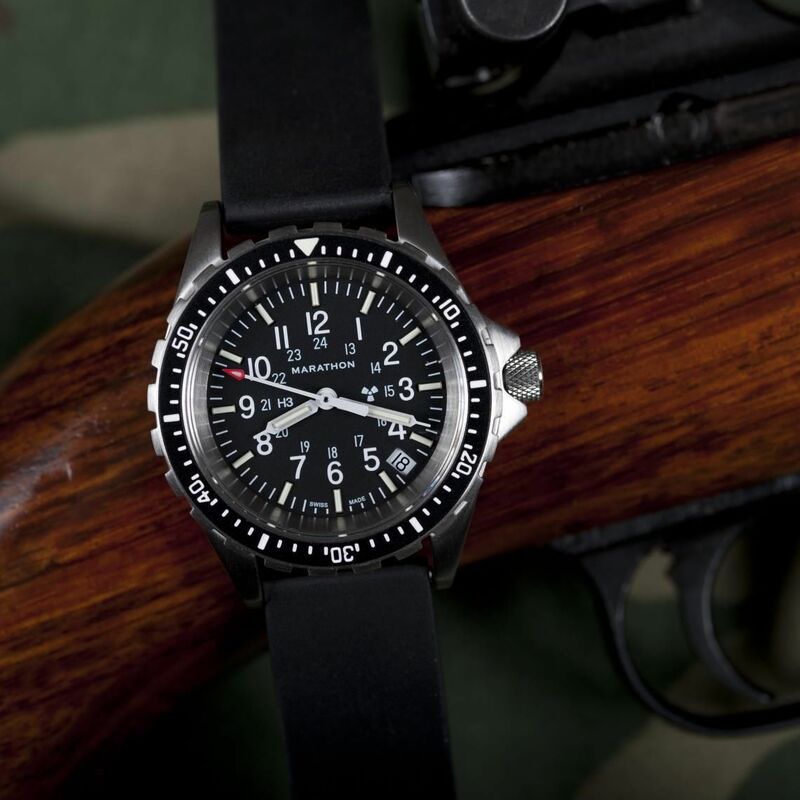 The 36mm Diver’s Quartz Medium is a dive watch certified for water resistance down to 30 ATM, uses a scratch resistant sapphire glass crystal to maintain maximum legibility, is built from 316L surgical grade stainless steel, and uses Tritium tubes for self-illumination in low light conditions. 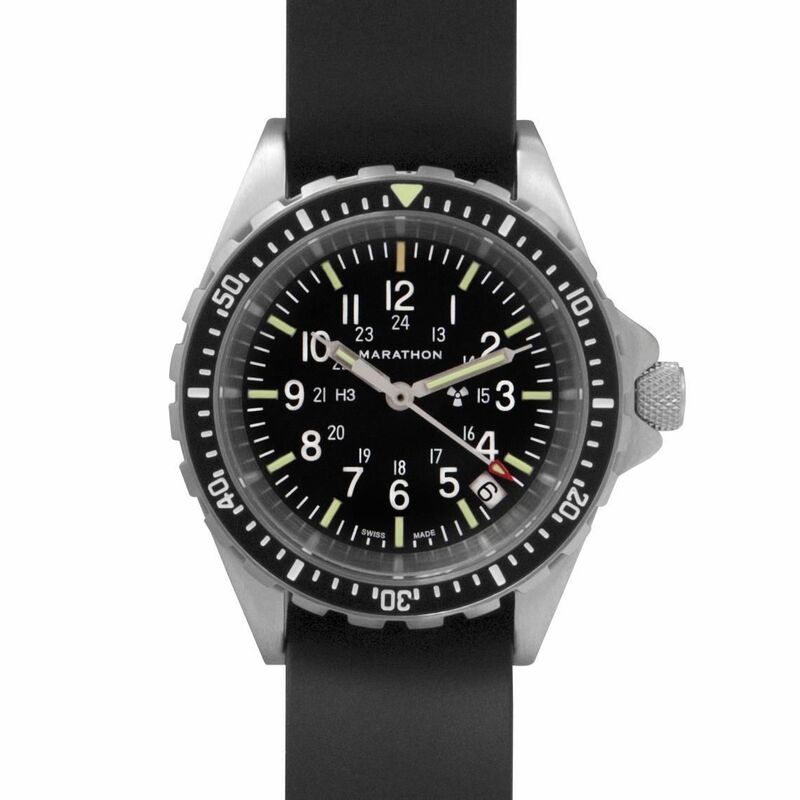 The Diver’s Quartz Medium is a tough watch that is perfect comfortable for people with smaller wrists or those who prefer a bit less bulk on their wrists. 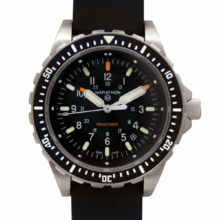 This Medium Diver’s Quartz Search and Rescue by Marathon: Demonstrator model was a sample piece used for display during a watch show. 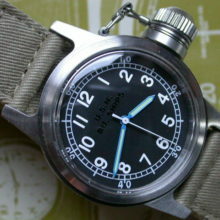 It has slight signs of use on the back (a single light scratch). 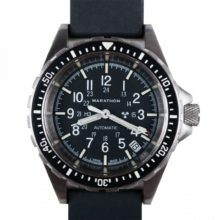 Otherwise, this is like new, comes with box and papers and is covered by Marathon’s 2-year warranty. 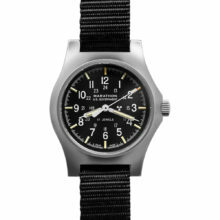 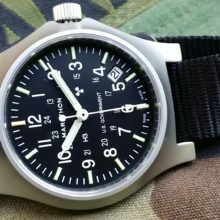 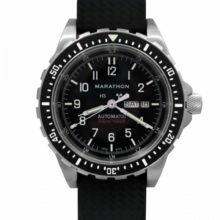 The Marathon Search & Rescue Diver’s Quartz Medium is a dive watch built to ISO 6425 standards but is a smaller, medium-sized, version of Marathon’s line of diver’s watches, perfect for someone who wants a tough, reliable, and military issue dive watch, yet prefers a reduced size watch that is just as tough as its larger brothers. 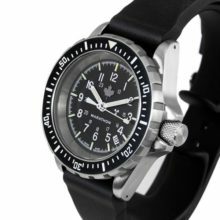 The 36mm Diver’s Quartz Medium is a dive watch certified for water resistance down to 30 ATM – 300 meters (1000 feet) underwater. 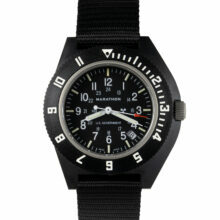 The Diver’s Quartz Medium uses a scratch resistant sapphire glass crystal to maintain maximum legibility. 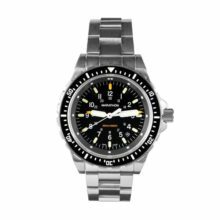 Built from 316L surgical grade stainless steel, the Diver’s Quartz Medium is a tough watch that is comfortable for people with smaller wrists. 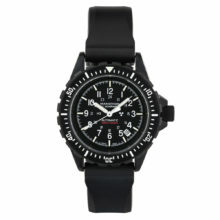 The Diver’s Quartz Medium includes a vulcanized rubber strap. 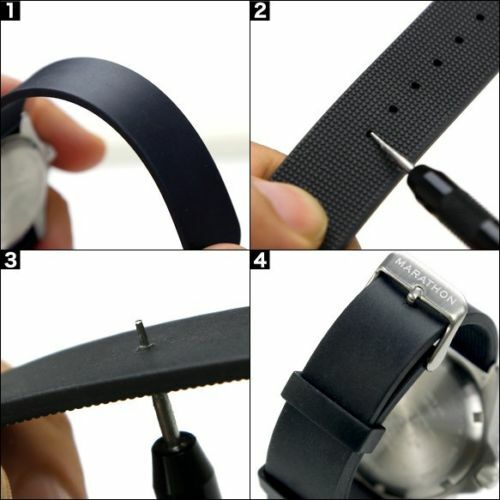 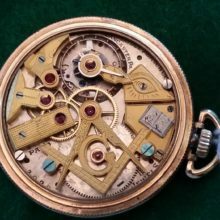 When first worn, the strap will have no holes to put the buckle through and instead must be carefully pierced. 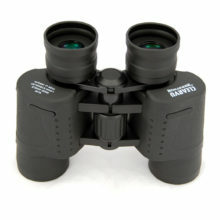 This can be done to create a custom fit for superior comfort and a clean, smooth look without extra holes. 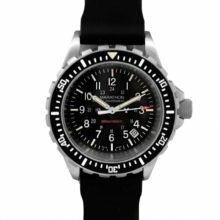 The Diver’s Quartz Medium is made in La Chaux de Fonds Switzerland to guarantee the highest level of quality and accuracy in manufacturing. 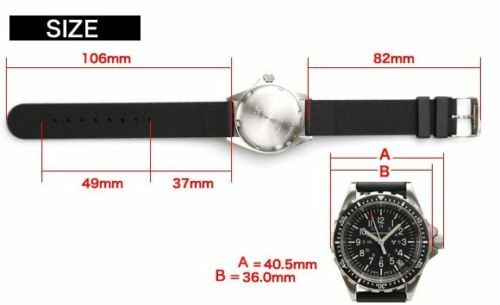 Inside the Diver’s Quartz Medium is a Swiss made, high torque, 3 jewel ETA F06 Quartz movement, the ETA F06 is accurate to -0.3/+0.5 seconds per day and includes an End of Life (EOL) indicator that will advance the seconds hand once every 4 seconds to inform you that a battery change is needed. 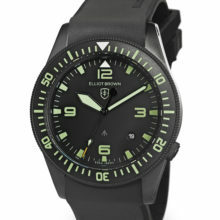 The Diver’s Quartz Medium uses self-contained Tritium gas tubes to ensure constant visibility in low light situations, a Tritium gas tube is placed on each hour marker as well as the hour and minute hands, Tritium tubes are self-illuminating gas tubes which contain an isotope of hydrogen that does not dull in brightness. 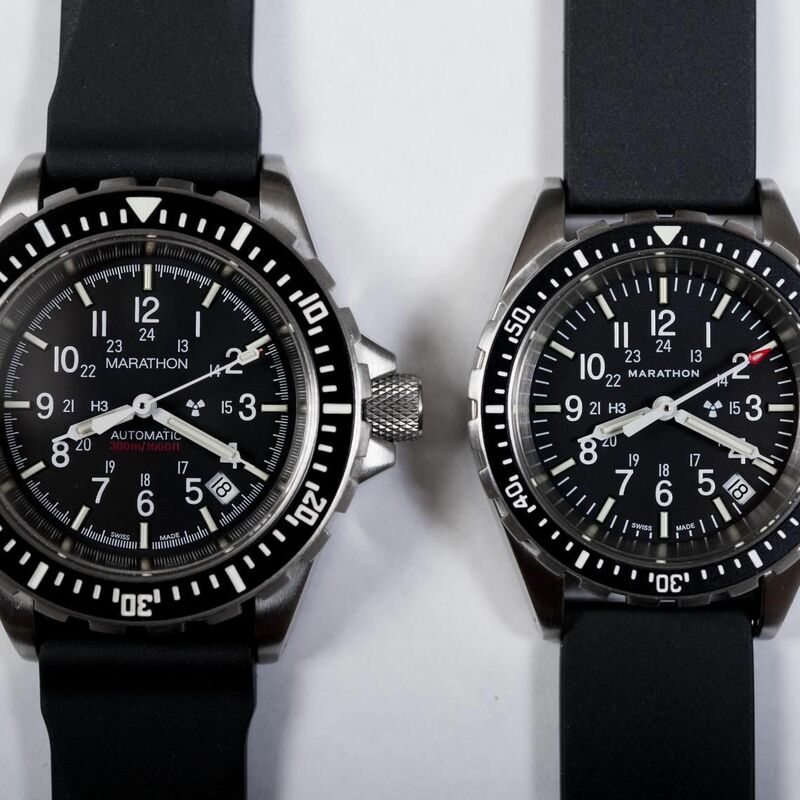 The Marathon Search & Rescue Diver’s Quartz Medium boasts the same toughness, water resistance and time-keeping excellence as the larger Marathon dive watches in a compact package. 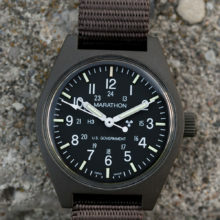 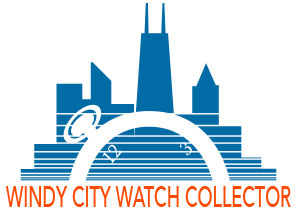 Each watch is individually numbered with an engraved serial number. 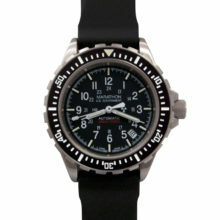 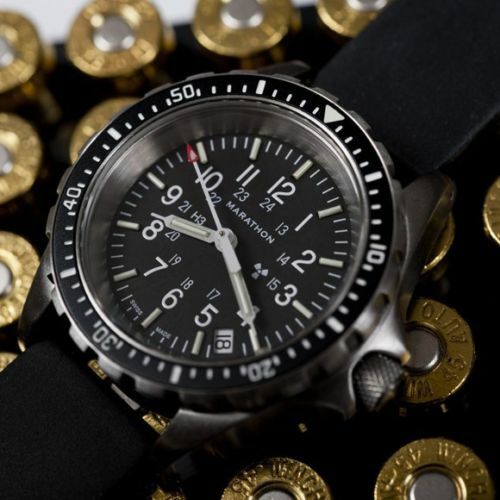 The ultimate compact sized current issue military watch and a superb professional dive watch!